Mitie, the FTSE 250 strategic outsourcing company, was awarded the Silver Leaf Award at the European Federation of Interior Landscape Groups (eFig) Awards this April. The award, which showcases industry excellence, recognises Mitie’s maintenance of the interior tropical plants at the Friends Life head office in Bristol. eFig is the trade association representing UK interior planting companies and stands as a mark of distinction for the interior landscaping industry as a whole. Mite’s landscapes business delivers grounds maintenance and landscaping services, including winter services, gritting, and tropical interior plants solutions. 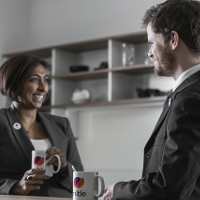 Tim Howell, managing director of Mitie’s landscapes business, said: “I am delighted that Mitie is gaining industry recognition for looking after our clients’ interior plants. We focus on providing a high quality service and our aim is to make our clients’ workplaces a thriving environment to work in.”The eFig award follows two BALI awards Mitie won at the end of last year for landscaping grounds at the Vodafone estate in Newbury, and for its outstanding interior plant design and installation at the Co-operative head office in Manchester.